ABSTRACT: During the outbound part of the close flyby of asteroid "2012 DA14" on 2013.02.16 I used a 14-inch Meade telescope configured with a prime focus HyperStar lens to observe the asteroid's r'-band brightness for 12 hours. The observations began 6.5 hours after closest approach, and the observing geometry was constant (sun-target-observer angle) which is ideal for determining a rotation light curve. The light curve is complicated, with several (real) bumps, and the rotation period on the outbound trajectory was ~ 9.1 hours. The rotation light curve (below) appears to go from just before a secondary minimum to just after it occurs again. The primary minimum is 0.23 magnitudes fainter than the secondary. This can be caused by the way the surface is illuminated by the sun and also by possible shading. The sun-target-observer (S-T-O) angle ranged from 75 to 81 degrees during the 10 hours that had useable data, so only about half of the asteroid was illuminated by the sun. Light curve showing the first 10 hours of a 12-hour observing session. The magnitude scale is based on 196 stars in 19 field of views that have calculated r'-band magnitudes based on their J & K magnitudes. 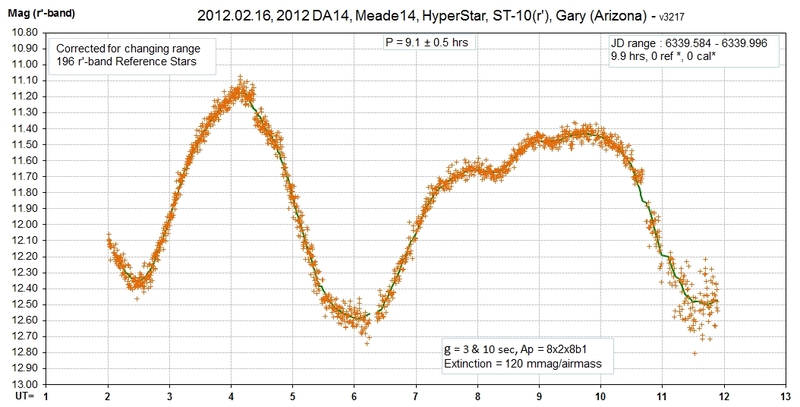 Asteroid "2012 DA14" was discovered in 2012.02.23 by observers at the Observatorio Astronomico de la Sagra, in Granada, Spain. It orbits the sun with a semi-major axis of 1.002 a.u., inclined to the ecliptic plane ~ 10 degrees and with a period of 368 days (until passage by Earth in 2013). It's diameter is estimated to be ~ 50 meters. After the 2013 Earth flyby the period is estimated to be 317 days. The 2013 flyby was from south to north, at a distance from Earth's center of 23,600 miles (5.7 Earth radii). Observers in North America had an observing window on the 2013.02.15/16 flyby starting on 2013.02.16, 0200 UT (7.6 hours after closest approach) and extending until sunrise the following morning (~ 12 UT). Dr. Lance Benner of Caltech's JPL is planning radar observations with the Goldstone Tracking Station (70-meter antenna) during Feb 16 - 20. Other radar observations are planned for Arecibo Ionospheric Observatory, MIT's Haystack antenna, the Allen Telescope Array (eavesdropping on GTS signals), and Norway. Dr. Nicholas Moskovitz (MIT) heads a large photometry observing project (KPNO's 2.1-meter telescope and others) in search of a change in rotation period caused by gravity gradient torques. Prior to closest encounter Dr. Moskovitz measured a rotation period of ~ 6 hours using a photometry-generated rotation light curve. 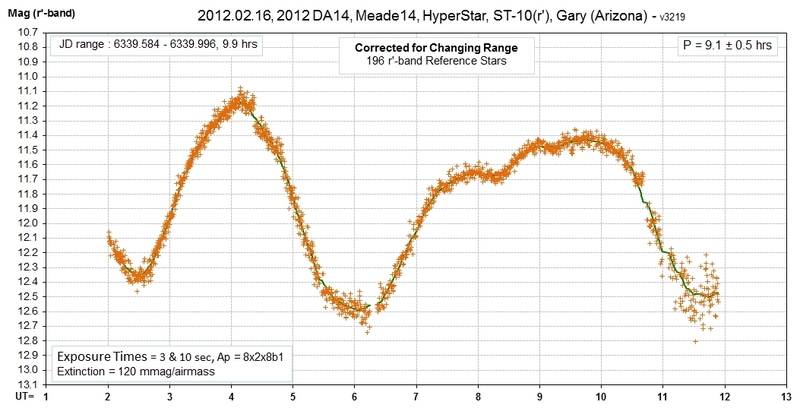 Observations at the Hereford Arizona Observatory (HAO) began 2013.02.16, 02:00 UT and ended 12 hours later. Figure 1. Hereford Arizona Observatory (HAO) consists of two domes with Meade 14-inch and Celestron 11-inch telescopes inside, that are controlled from an office using cables in buried conduit. Figure 2. Prime focus lens (Starizona's HyperStar) and CCD camera (SBIG's ST-10XME) with 10-slot filter wheel. A HyperStar prime focus lens (manufactured by Starizona) was used with the Meade 14-inch telescope. 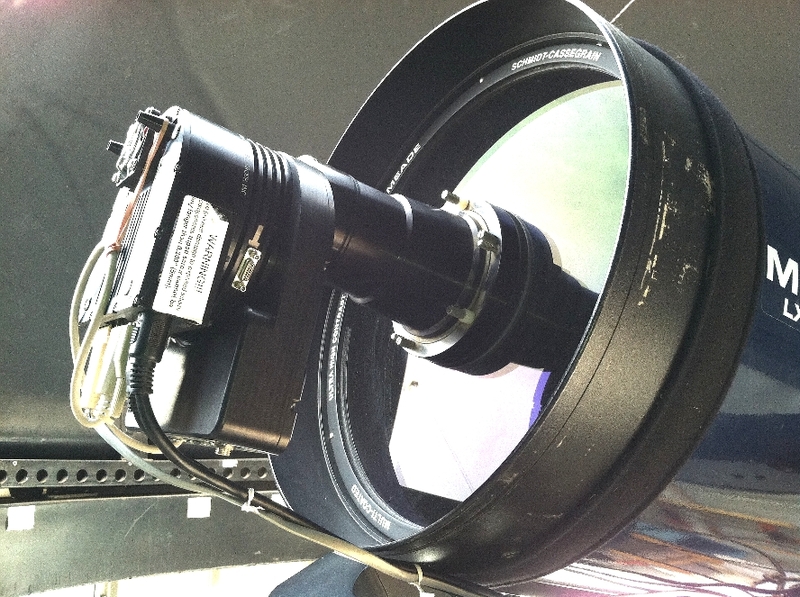 An SBIG ST-10XME CCD camera and filter wheel assembly is attached to the HyperStar lens. The focal ratio is f/2.03, which provides an image scale of 1.95 "arc/pixel and field-of-view (FOV) = 71 x 48 'arc. Yes, the large filter wheel blocks light, but when the optics are collimated and the primary mirror is focused the point-spread-function (PSF) is very sharp and there's no obvious evidence of some lost light. The PSF has a FWHM as small as 2.0 pixels (4.0 "arc) when properly focused. This compares with typical PSF widths of 2.5 to 3.5 "arc when observing in Cassegrain configuration (at my observing site). The small loss of PSF sharpness is unimportant compared with the 7-fold increase in FOV area. MaxIm DL was used to control the various components of the observatory: telescope, CCD, filter wheel, wireless focuser (Starizona's MicroTouch) and dome. Control lines run through a buried conduit, and AC power is provided by a separate buried conduit. A pattern of 19 FOV placements were used to observe the asteroid for a 12-hour observing interval. Each FOV change was accomplished using the MaxIm DL "Move telescope here" tool, which used about one minute of observing time. If the telescope had been in the Cassegrain configuration the number of FOV position changes would have been ~ 50, and this would have reduced the time available for exposures. This illustrates the importance of observing near-Earth-objects with as large a FOV as possible, which underscores the importance of the HyperStar configuration. The choice of r'-band was motivated by two considerations: 1) an expectation that the asteroid would be redder than a typical star, and 2) the r' filter has the highest throughput of the entire set BVRcIcg'r'i'z'. Only the Cb filter (clear with blue-blocking) has greater throughput, but it suffered from image quality problems that I didn't have time to diagnose. A few hours before observations began calibration images were taken using the r' filter. These consisted of bias (N=26), dark (N=20) and flat (N=14). The apparent motion of "2012 DA14" was fast at the beginning of the observing period (~ 160 "arc/minute) and was much slower near the end (~14 "arc/minute). Exposure times went from 3 seconds at the beginning to 10 seconds during the second half of the observing session. In the first several images the asteroid's PSF had an oblong shape, ~ 8"arc in length, while the PSF quickly became circular due to a slowing sky motion - as the image in Fig. 3 illustrates (taken ~ 10 minutes into observing). A total of 2250 images were taken during the 12-hour observing session, but due to focusing drift that occurred while I was sleeping only the first 1910 images (10 hours) were useful. Figure 3 is a typical single frame. The circular photometry pattern shown is "twice" the size used for measurements. Photometry measurements were made with a signal circle having an 8-pixel radius, a 2-pixel gap, and an 8-pixel sky background annulus. This choice meant that for a typical range of seeing (and tracking quality) ~ 97 % of each star's flux was "captured" by photometry measurements. The HyperStar produces essentially the same PSF over the FOV, so for each image the capture fraction was the same for the asteroid and all reference stars. This is an important requirement for differential photometry because it means that capture fraction can be different for each image without affecting the target's instrumental magnitude. Figure 3. Single frame at 02:10 UT showing "2012 DA14" (circled) when r'-magnitude = 12.4 and SNR = 88. Limiting magnitude for this 3-second exposure = 17.3 (for r'-band). North up, east left, FOV = 71 x 48 'arc. Approximately 15 to 20 "reference stars" were chosen for use for each of the 19 FOVs. Stars close to saturation were avoided. 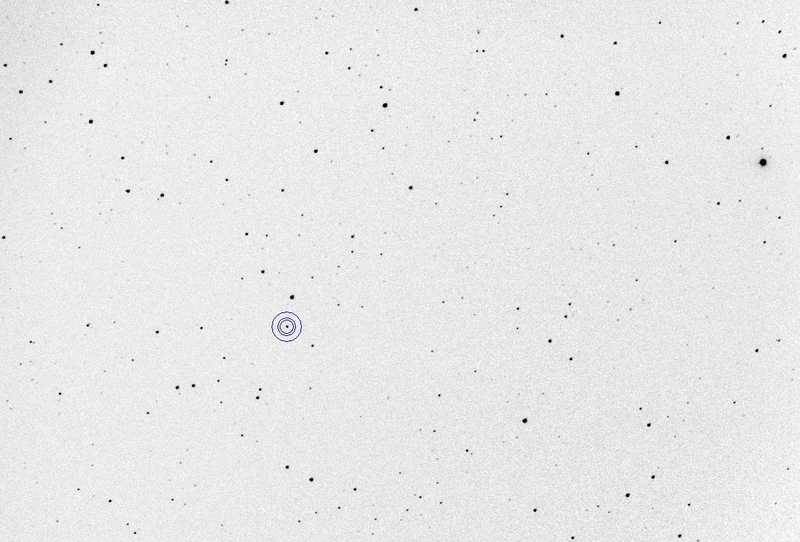 MaxIm DL's photometry tool allows for a moving target (to accommodate asteroid observers). The moving target assumes straight line motion, and sometimes when the asteroid moves close to a bright star the program makes a tracking mistake. When this was noticed I divided the FOV image set into subsets of 2 or 3, and this always led to correct moving target tracking. MaxIm DL allows for a visual inspection of each FOV's light curve before recording to as CSV data file. None of the "reference stars" showed variability. Quote marks are used for "reference stars" because an artificial star was used as a single reference, and the 15 to 20 stars chosen as candidates for reference were assigned "check star" status in the MaxIm DL photometry routine. This was done because at this stage of analysis none of the stars chosen as candidates for reference (the "check stars") had known r' magnitudes. A CSV-format data file was recorded for each FOV. The CSV files were imported to an Excel spreadsheet. 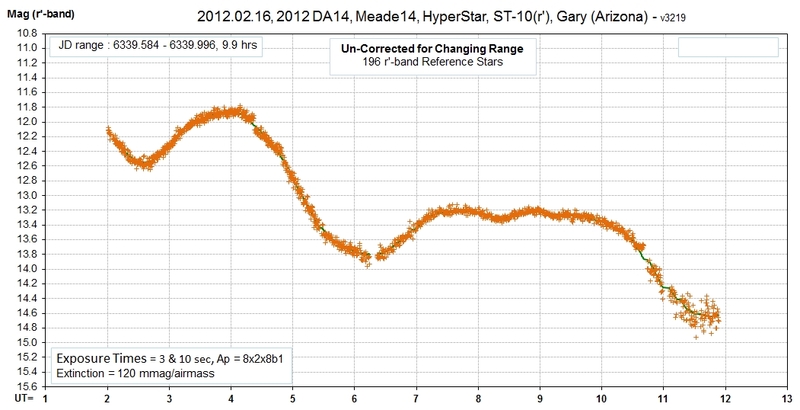 The instrumental magnitudes (referenced to an artificial star with arbitrarily assigned magnitude) were adjusted for changing asteroid range and plotted as a crude light curve (LC). Such a LC would be valid only if atmospheric extinction were constant throughout the observing session. Since "2012 DA14" was close to the north celestial pole during the entire observing session all data were confined to a small range of air masses (monotonically changing from 2.51 to 1.93), and if zenith extinction was constant then atmospheric extinction for the asteroid would also be constant. The resultant LC looked almost exactly like the figure in this web page's abstract (repeated as Fig. 5). The next analysis phase was to obtain r' magnitudes for some of the reference stars in each of the 19 FOVs. Asteroid observers are familiar with the Carlsberg Meridian Catalog (release 14), because it includes r'-band magnitudes that are useful to r' ~14.5 for most of the sky where asteroids are observed, from declination -40 to +52. The north celestial pole region is without r' magnitude coverage, but these stars have J, H and K magnitudes. I used the standard SDSS magnitude catalog of Smith et al (2002) which contains 102 stars calibrated in bands u'g'r'i'z' and found a way to convert J and K magnitudes to r' magnitude. As Fig. 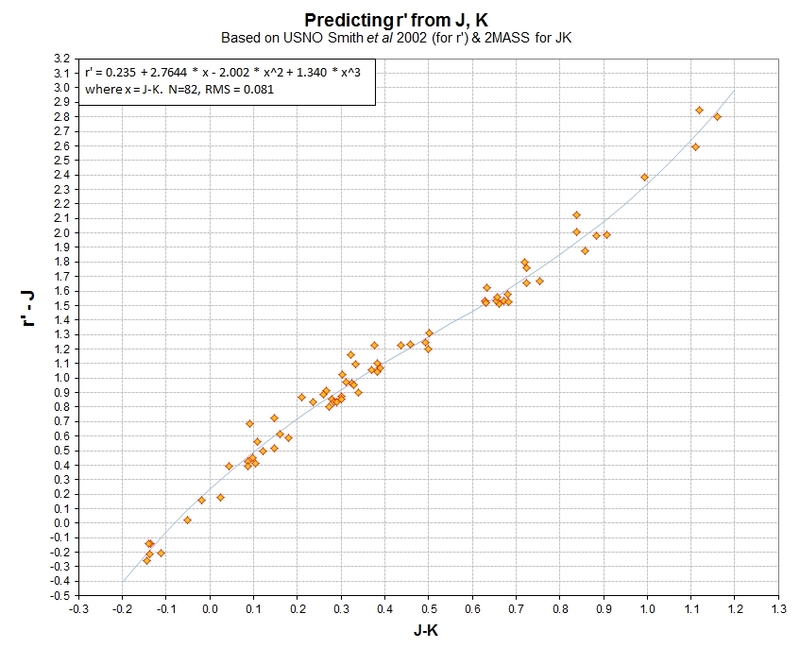 4 shows, a 3rd order fit of r'-J to J-K can be used with ~ 0.08 magnitude SE throughout a large range of J-K star color. All of the candidate reference stars in each of my 19 FOVs could be converted to r'-magnitude using a simple conversion equation. This was done for an average of 10 stars for each FOV, which assured a range of star colors (e.g., J-K) were represented for each FOV. Each FOV's set of reference stars provided internal consistency (after rejecting a few outlier stars, possible variables) with a SE on the average of 0.015 magnitude. This accuracy is ~ 1% of the asteroid's brightness variation, so the offsets of data for one FOV to the next is expected to be insignificant. Figure 4. Color-color relationship for "r'-J" and "J-K" that can be used to convert J and K magnitudes to r'-magnitude. When the candidate reference stars were assigned an r'-magnitude they "became" reference stars. The resultant r'-magnitudes for one FOV were verified using a traditional differential photometry procedure, so it was not necessary to reprocess all image sets using the traditional method. A total of 196 stars with r'-magnitude calculated using the JK conversion equation were used for the 19 FOVs. Measured r'-band brightness is plotted versus UT in Fig. 5. The fading trend is caused by an increasing observer-target range. The noisiest data after 11 UT is partly due to the asteroid's faintness and also to a drifting focus error that was not noticed and corrected (because I was asleep at the time). Figure 5. Light curve showing the first 10 hours of a 12-hour observing session. The magnitude scale is based on 196 stars in 19 field of views that have calculated r'-band magnitudes based on their J & K magnitudes. No correction has been applied for the asteroid's changing "observer-target" range. The fading effect of increasing target-observer range was removed by applying a third-order polynomial fit to the JPL ephemeris listing of asteroid apparent magnitude. The final LC for the first 10 hours of the observing session are shown in Fig. 6. Figure 6. Light curve showing the first 10 hours of a 12-hour observing session. The magnitude scale is based on 196 stars in 19 field of views that have calculated r'-band magnitudes based on their J & K magnitudes. The thick trace is a running average. A few outlier data points have been deleted. Data past 12 UT are not worth processing. Several features of this LC are noteworthy. 1) The primary minimum is at 6.1 UT, and it is my interpretation that the minima at 2.45 UT and 11.6 UT are secondary minimum. If so, then the rotation period is ~ 9.1 hours. 2) There's a magnitude difference between the two secondary minima, but it may not be statistically significant due to the noisiness of data past 11 UT. 3) The primary minimum is 0.23 magnitudes deeper than the secondary (ratio of 1.24). 4) the shape of the brightest maximum is significantly different from the shape of the fainter maximum. One is "pointed" and the other is "bumpy flat." 5) The fainter maximum "bumps" are probably real since they also appear in the LC produced without the use of reference stars (instrumental magnitude vs. UT, assuming no atmospheric extinction changes and adjusted for changing range). 6) The interval between the secondary and primary minima is ~ 2.45 hours, whereas the interval between the primary and secondary minima is 5.5 hours. These intervals are in the ratio of ~ 2.2. This might be what would be seen by a "rotating banana." The rotation period of ~ 9.1 hours is ~50% greater than the preliminary measurement of 6 hours by Moskvitz (private communication). If the period difference is real then it would constitute evidence for a change in rotation period caused by gravity gradient torques, which is a major goal of the "2012 DA14" photometry project led by Moskovitz. Smith, J. Allyn, et al, 2009, AJ, 123, 2121-2144.